Chapter 4 examines franchise fee contracts in the product service system with demand information asymmetry. In this chapter, three types of contracts are developed to optimize the operations of product service system in the service-oriented manufacturing supply chain. The first is the franchise fee contract under which a two-part tariff including a wholesale price and a franchise fee is provided. The second is the franchise fee with service requirement (FFS) contract under which a service level is specified in addition to a two-part tariff. The third is the franchise fee with centralized service requirement contract which is similar to the FFS contract but that the service level specified is the system-wide optimal solution. 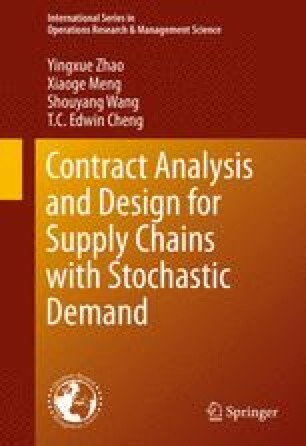 This chapter mainly addresses the issues of how to design the contracts by which to assure a credible information sharing across the supply chain and how different these three forms of contracts affect the supply chain. The research can provide managerial insights for optimizing product service system by franchise fee contracts in the service-oriented manufacturing supply chain with demand information asymmetry. The research of this chapter is based on Xie et al. (2013).